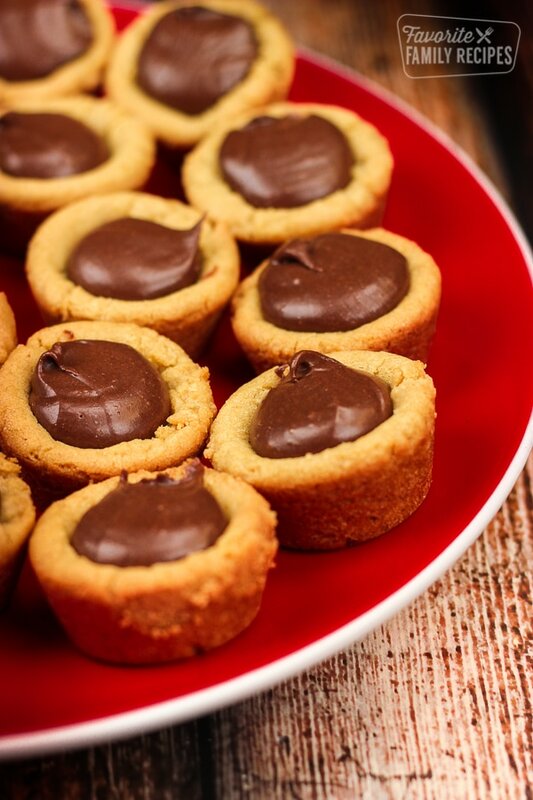 Peanut Butter Fudge Puddles are a chewy peanut butter cookie cup with a chocolatey fudge filling. They are like a reverse Reese’s Peanut Butter Cup! These Peanut Butter Fudge Puddles never last long in our family, due to the fact that everyone keeps sneaking into the kitchen to steal just one more. 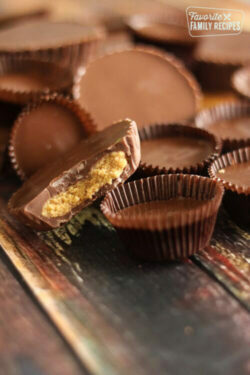 If you like peanut butter and chocolate – you have got to try these. I am a big fan of peanut butter cookies but add some chocolate and I am in heaven. See for yourself! Try them once, and you’ll be hooked. 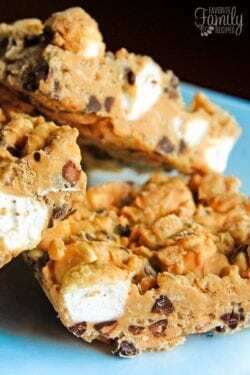 They are the perfect blend of peanut butter and melt in your mouth fudge. They are so cute, too! They make great little treats for parties or baby/bridal showers. Your guests will go crazy over them! Add some pizzazz by adding sprinkles or cookie crumbles to the top. They are the perfect little bite-sized treat! This recipe for a peanut butter cookie is amazing in itself, but add the chocolate fudge center and it is over the top good. 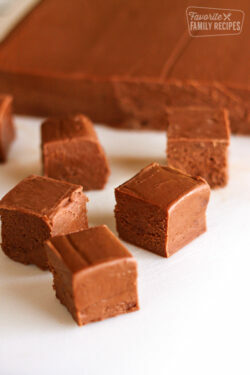 If you want to try some variations you can try substituting the chocolate fudge center for some different fillings. You can do frosting in the center or a chewy caramel. We have also added chocolate candy in the center, like little peanut butter cups or Rolos. I love all the yummy treats that our family makes around the Holidays. These Peanut Butter Fudge Puddles are just one of our favorite Christmas treats. You can find the list of all our favorite treats for Christmas HERE. It has some amazing sweets that are perfect for neighbor gifts and Holiday parties, like homemade caramels, peanut clusters, cinnamon almonds, german chocolate fudge, and peppermint bark brownies! Peanut Butter Fudge Puddles are a chewy peanut butter cookie cup with a chocolatey fudge filling. They are like a reverse Reese's Peanut Butter Cup! In mixing bowl, cream butter, peanut butter and sugars. Add egg and vanilla. Stir together flour, baking soda and salt. Add to creamed mixture. Mix well. Chill for 1 hour. Shape into small balls. Place in lightly greased mini muffin tins. Bake at 325 for 14 minutes or until lightly browned. Remove from oven and immediately make "wells" in the center of each cookie (sometimes this will happen automatically) Cool in pan for 5 minutes, then carefully remove to wire rack. Melt chocolate chips in microwave by heating the chips in a microwaveable bowl for 30 seconds. Stir. Continue heating in 30 second increments until the chips are all melted. Stir in milk and vanilla. Mix well. Warm thoroughly. Put filling in zip-lock bag, cut the corner, and squeeze fill each cookie with fudge. Someone submitted this recipe for my Cookie Makes a Comeback recipe blitz. Looks delightful! Hey Rookie Cookie! I love your website!!!! Thanks for the comment! These look amazing- my son wants them for his birthday party! How many does this recipe make? This makes a pretty small batch. If you have more than 10 people coming I would double it. Could you use Nutella to fill these instead of the choc. chip/condensed milk mixture? I have the same question as Hattie…………..the comment before mine. These look amazing! You could definitely fill them with Nutella. The consistency and taste of the filling will be obviously different, but they will taste great. I love Nutella! I would love to buy a mixer like what you have. Can you tell me what brand of your mixer? It is a Bosch mixer. I love it! You can sometimes find them at Costco. Bosch has stores throughout the United States or you can go to there website, bosch.com. Made these today and they turned out delicious. How many cookies are there in this one batch? Thanks for asking, Amber. I get 48 cookies – or 2 mini muffin tins – of cookies from one recipe. Thank you very much. I am going to make fudge puddles . We use white unbleached flour, not self-rising. Thanks for asking! Do these have to be refrigerated because of condensed milk? I’ve alsways wondered about anything that has this ingredient and whether to leave in cookie jar or refrigerate. I have not kept them in the fridge. I’ve always left them out, but covered in an airtight container. 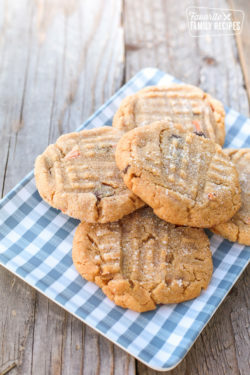 Can you use store bought peanut butter cookie dough for this recipe? Yes, using store bought cookie dough would be an easy shortcut on this recipe. No, they do not need to be refrigerated. I do keep them covered though so they don’t dry out. Thanks for asking! I really want to make this recipe.. But since i`m dutch, i have to recalculate the cups into grams. That is no problem.. but what is the amount of the condensed milk? It says 1 can, but how much is that ? Hi Sandra, one can of condensed milk is 14 ounces or 396 grams. Thanks for asking! It is a Bosch mixer and I LOVE it! I’ve had it for years and it has had A LOT of use. I’ve never had a problem with it. You can sometimes find them in Costco. Bosch also has kitchen stores across the U.S. and an online store. That is a Bosch Mixer – the new ones look a little different but they are awesome! Making these today! They look so yummy! Hopefully I will get back & post how they turned out. Thank you for this recipe. So the chocolate siezed up on me when I added the vanilla and milk. How do you avoid this? I ended up melting it all on the stove but then it was very hot when I went to pour into the bag and it got worse from there…bag was too hot to handle it was a mess…but we salvaged it all and they are yummy but I want to know where I went wrong cause I’m making more! Thanks. Oh no! What a disaster! My guess is that the chocolate spent too much time in the microwave and got way too hot. You want to microwave it on a lower heat for like 30 seconds at a time until it is JUST melted. It only should take a couple times in the microwave to get it smooth and melted down. Any time you melt chocolate you want to do it low and slow. Using a double boiler helps with this too. Sorry, we should have been better at explaining this in the recipe! These look great.. I was wondering how long after assembling the cookies do they last for? EG do they still taste and look great after a week? I’d like to make ahead for a large party and didn’t really want to freeze them. They usually taste best for up to 2-3 days. Freezing them does work but if you are against it, you can just make them a few days ahead. Hope this helps!